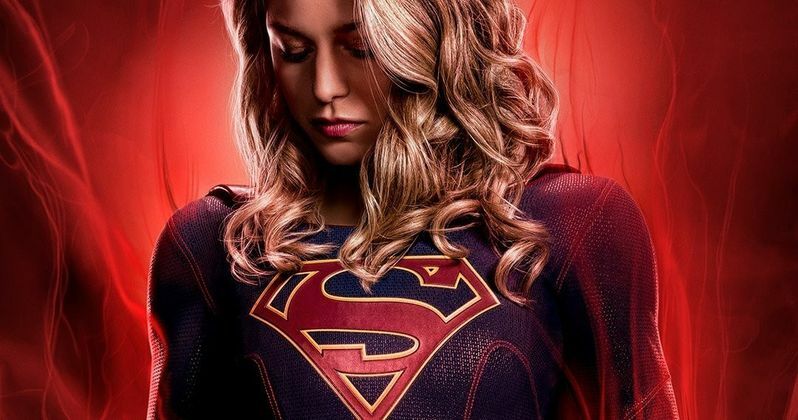 The CW has released a new Supergirl poster and a fresh batch of photos ahead of the show's upcoming season 4 premiere. It's going to be another big year for the Arrowverse and Supergirl is going to be a major fixture of this season's small screen DC happenings. Not only is season 4 inspired by a classic Superman comic, but we're also getting some new characters and an exciting new hero, who will be introduced in the season premiere, as revealed in these photos. First up, we've got the Supergirl season 4 poster, which features star Melissa Benoist looking fierce and suited up to protect the city from evildoers. She's looking down, fists clenched and bathed in glowing red fire, which is completly surrounding her. The season 3 finale helped set up a take on the Superman: Red Son storyline, which sees an alternate version of the Man of Steel who was brought up in Soviet Russia. In this case, it's Kara who will be the subject of such a story and the red fire seems to be hinting at that, at least subtly. The network also released a large batch of photos from the season 4 premiere, titled American Alien. They feature various looks at Mercy Graves (Rhona Mitra), Lena Luthor (Katie McGrath), James Olsen/Guardian (Mehcad Brooks) and our titular hero hanging around the CatCo offices. There are also several shots of Benoist in costume. But it's the photos of Nia Nal/Dreamer (Nicole Maines) that are probably the most interesting. Maines is set to play the first ever transgender superhero on TV and these photos offer an initial glance at the character. While we don't actually get a look at Nia Nal as Dreamer here, we see her interacting with Kara and settling into her position at CatCo. She will be introduced as a new member of the reporting team. It should be quite interesting to watch a new superhero origin story unfold as Supergirl furthers her own journey, who is a bit more comfortable in the cape with several years of work under her belt. It seems likely we'll see Kara take on something of a mentor role as Nia transitions into her new life as a crimefighter in National City. Will we see Dreamer show up in this year's big Arrowverse crossover event where Ruby Rose will make her debut as Batgirl? With the event taking place in December, that would allow time for Dreamer to be fleshed out before teaming up with The Flash and Arrow. A synopsis has yet to be released for American Alien so, for the time being, it's still a little unclear what we're in for when the show returns. The Supergirl season 4 premiere is set for Sunday, October 14. Be sure to check out the newly released photos and season 4 poster from The CW for yourself below.